July 22, 2002 - 5:00 p.m. The neighboring streets are small and not too busy, though cars pass by on a regular basis. 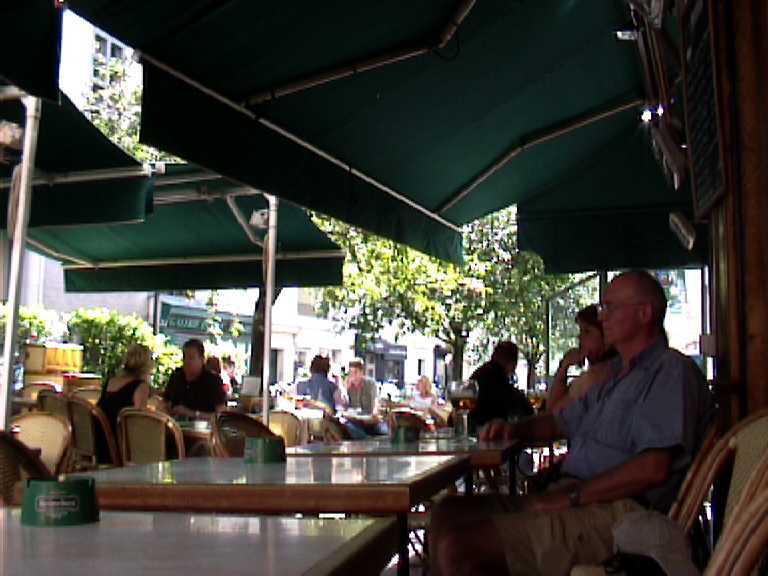 The outside tables farther from the café are a bit protected from the street by way of portable hedges and protected from the sun by portable green awnings. The tables are a nice size, square with light colored marbled tops. The ashtrays are courtesy of Heineken. I was given a red packet of sugar cubes with my espresso. The chairs are wicker with predominantly beige plastic caning. Sunlight reflects off the smoke of the many cigarette-wielding customers, creating a shimmering, ephemeral haze that wafts by and then is gone.